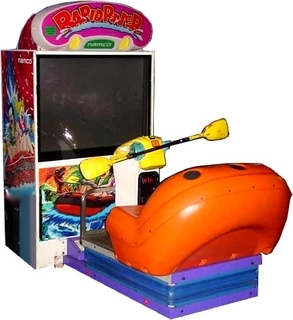 It turns out that the physically draining whitewater game we played, Namco’s Rapid River, isn’t a one-of-a-kind machine. It’s just the latest in a wave of revolutionary video games that simulate various sports. Downhill mountain biking? It’s here. Virtual skateboarding? Yup. Hang gliding? That, too. Name a sport and a video game “simulator” exists or is being developed by some demented computer genius. And no matter how big a stud you were at Asteroids, you’ve got to be fit, skilled and athletic and have splendid hand-eye coordination before you can even think about becoming a great player at these games. A thick wallet helps, too: Each game costs anywhere from $1 to $4 per play, depending on the game’s complexity and the arcade owner’s level of greed. Posted: July 25th, 2015 under Gaming.